I kept going back and forth on doing any port adventure in Cozumel, but two weeks before the trip I went to look at the options and since I could book the private vehicle w/ lift option online I finally just went ahead and did it. I am glad we did because while we only used it for two hours, we had a great family adventure at the Mayan ruins. The private vehicle w/ lift was really just an accessible taxi. The driver was a great guide, though, so they clearly are experienced taking people around as guides. The lift was in the back and there were two bench rows of seats in front. He did have to duck his head when going in, though, which was sort of inconvenient. 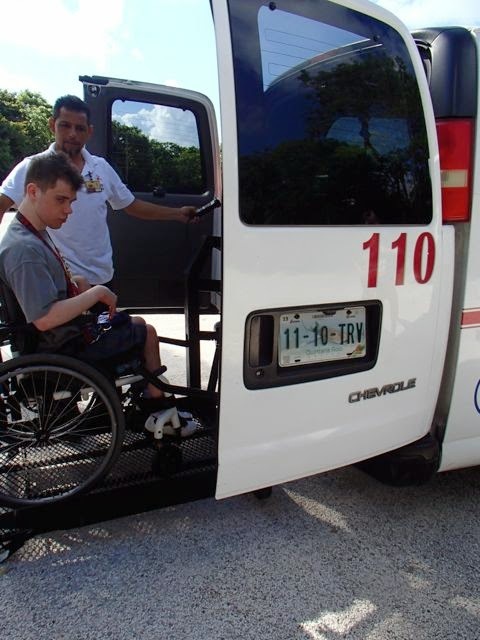 Good thing we didn’t bring the power chair, as that would have never worked in the vehicle or at the Mayan ruins. There were no tie downs, but it must not have been too bad because Mik did not freak out that much and he is known to freak out on the Walt Disney World buses and Super Shuttles where they do use great tie down techniques. There also weren’t any working seat belts, so it’s not like the other passengers were any safer.